1) Combine the besan in the water without forming lumps in a bowl. 2) Add extract of ginger and green chilly. 3) Add salt and sugar to taste. 4) Then keep it on the slow flame and keep stirring continuously until it leaves the sides and becomes thick. 5) Don’t stop stirring even for a second. 6) It will take about 25 minutes. 7) Divide the batter into two portions and pour the dough on the inverted side of a thali and then spread it as soon as possible,wait for a minute to cool,cut it into thin strips and roll each strip from one end to the other with your fingers gently like a swiss roll. 8) Temper it with mustard seeds and curry leaves. Imp tip :To test the dough, put a little dough on a inverted side of a small plate,spread thinly and try to roll it,if it rolls without breaking khandvi is ready. 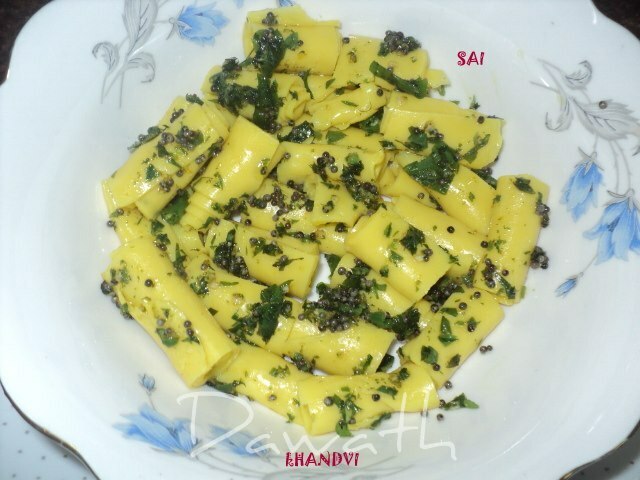 You may also spread the khandvi in the clean kitchen platform.